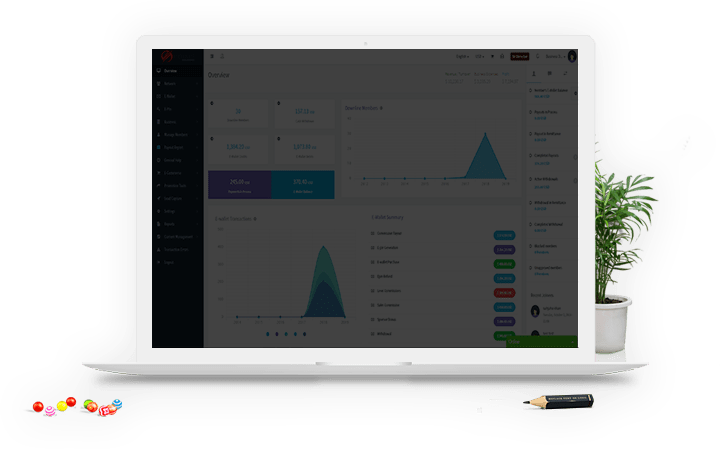 Epixel MLM Software is one of the best mlm software solutions available in the Multi Level Marketing world to manage, control and organize your network marketing business. Epixel MLM program let you configure custom pay plans and compensation rules. Our package includes necessary features like E-wallet, managing distributors & downline members, handling MLM leads, processing commissions & payouts, enable or disable dynamic compression, track sales volumes, profitability statistics, etc. As out-of-the-box features, we have included a special option to manage rank rules and parameters for the leaders. The best part of Epixel MLM Software is its lightning performance, scalability, dedicated payout system, and mobile-friendly design. As an open source software, it brings in more security and modular approach to realize customizability, where you can change or enhance the MLM system based on the varying business trends. We offer reliable web-based/online application which can easily be integrated with CRM, e-commerce systems, blockchain applications, ICOs, Cryptocurrency Mining, Forex trading, etc. As the "Best MLM Software Development Company", Epixel offers solutions for all compensation plans and serves customers all over the world. Multilingual and multi-currency options let you cross the language and international barriers. A high-performance engine to calculate compensations and rank processing integrated with Epixel back-office software. Epixel MLM application uses Business Intelligence (BI) Tools real-time data to provide insights with a simple version available for every users and admin. Epixel Solutions Pvt. Ltd. the best MLM Software company offers you an exclusive list of four important services that will enhance your multi level marketing business to an Enterprise level. Consult with Epixel MLM Business Plan/Pay Plan experts to design a new profitable compensation plan which suits your business goals. A custom comp plan with advanced features will make a new revolution in the MLM industry. Proper training would always benefit from your choices. Training on the working of our MLM tracking software, compensation plans, settings, features, etc. with guidelines and demonstration videos. We always listen to you. Our MLM Software consultants speak your language with utmost fluency. We offer 24/7 support in English, Spanish, German, Italian, French, Romanian, Bulgarian, Russian and Chinese. Our research and development team is completely engaged in improving the software quality and bringing the latest innovative ideas to enhance the usability. Our MLM program is preloaded with all the necessary features to start and build an enterprise level business. As #1 MLM software provider with legacy and experience in MLM domain, Epixel Solutions added some advanced and unique features like Intelligent insights, dedicated calculation engine, and sophisticated promotion tools which will boost your MLM leads and bring more productivity. We follow all the quality and security guidelines and recognised as ISO 9001:2015 certified company and we ensure complete customer satisfaction for a long-term relationship. Watch our free software demo and remark us with your quote for the further discussions. Our presence is spread across the globe, and the numbers shown below exhibits our strength as a globally accepted brand. A suitable MLM Script used in multi-level marketing business. The binary plan has two sub-team, one on the left and the other on the right, and it spread down. A commonly used network marketing compensation plan where, the compensations are structured in specific width and height i.e., a fixed ratio is maintained. One of the leading Direct Selling Software pay plan where a distributor can have unlimited direct sub-distributors and distribute over a single row or level. A widely used MLM software plan where the direct sales marketing strength is used in the matrix plan with donation and crowd-funding systems. Features have its importance in every network marketing software, as it tends to be the criteria for choosing a software that suits your marketing business. Our MLM Software is fully packed with all advanced features required to start an affiliate marketing business. The features and compensation rules can be customized to meet the company's business strategy. Let's see the key features of our multi level marketing software apart from the custom options. Most of the Affiliate marketing business is associated with the selling of the product & services. The Epixel Multi-level marketing software is capable of integrating with any E-commerce system. "Network Marketing" is a global business, & customers can join from different regions & countries. For customer & business team’s convenience, our back office software supports multiple languages and currencies. Our MLM system provides the business team to manage the member, access control, IP-blocking, blocking & unblocking of members. Member line-up is thus now manageable. Track income, expense, business reviews, and profitability, using our online MLM Software transactions reports & graphical statistics insights. Both business & customers have access to such set of reports. The business team can promote the business by creating marketing campaigns and attractive discounts. We provide unique campaigning and sweep-take options in our mlm systems to meet the business targets. Supports multiple payment options based on the business integrations, we have ready-made integrations with all the popular payment gateways and cryptocurrencies like Bitcoin, Ethereum, Litecoin, Ripple, EOS, Stellar etc. Almost everything in our network marketing software is configurable! The pay plan, downline members, upline members, MLM leads, distributors, leaders, sponsors, dynamic compressions, payouts, and almost everything in the system. Epixel Solutions Pvt. Ltd. follows a perfect working rule and maintains an 8-step working streamline. We ensure a complete system routine through an effective plan from the preliminary concept or idea to Quality assurance before the deployment of the project. Analyze the business requirements and initialize with an abstract model. We develop a marketing plan that syncs perfectly with your business. Develop the best system following every coding attribute as per the plan. Test each and every unit separately to validate the purpose is as designed. Evaluate the system functionalities before the acceptance. Complete training about the usability of the system and guidance with after-sale support. We value our customers, and their opinions matter the most! Epixel Solutions was suggested by a friend of mine. I needed someone to get involved with an existing MLM project. I was amazed how quickly Epixel Team were able to grasp the mlm plan concepts used to make this application a reality. Epixel Solutions really got a Talented team of skilled engineers, I am using Epixel binary MLM plan for more than 4 years. I am very much comfortable with the team and software is doing its job wonderfully. They really did an appreciated job. I really appreciate the MLM Solutions that Epixel Solutions offer. Besides, I also appreciate the quality output, problem-solving capabilities and the precision of execution that this company offers within the specified time limit. Aren't you interested in our MLM Software now? Let's bring in a good fortune into your business. So, shall we get started?